Malays inhabit Indonesia and Malaysia. They are connected with each other since time immemorial. The separation of Malays in two countries offers an interesting relationship. 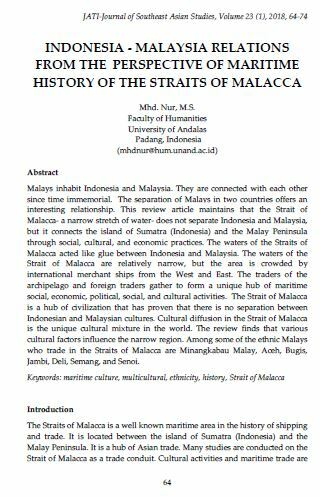 This review article maintains that the Strait of Malacca- a narrow stretch of water- does not separate Indonesia and Malaysia, but it connects the island of Sumatra (Indonesia) and the Malay Peninsula through social, cultural, and economic practices. The waters of the Straits of Malacca acted like glue between Indonesia and Malaysia. The waters of the Strait of Malacca are relatively narrow, but the area is crowded by international merchant ships from the West and East. The traders of the archipelago and foreign traders gather to form a unique hub of maritime social, economic, political, social, and cultural activities. The Strait of Malacca is a hub of civilization that has proven that there is no separation between Indonesian and Malaysian cultures. Cultural diffusion in the Strait of Malacca is the unique cultural mixture in the world. The review finds that various cultural factors influence the narrow region. Among some of the ethnic Malays who trade in the Straits of Malacca are Minangkabau Malay, Aceh, Bugis, Jambi, Deli, Semang, and Senoi.